There is a piece of furniture in your minds eye, but you can’t seem to ever get it out. You can see it in your head as plain as day, then you build it, you step back, you look and it’s nothing like what you saw in your mind. If this sounds familiar to you, here’s why. When you visualize a piece in your mind, you don’t see it in a surrounding, you don’t see it against the wall and you don’t see it on the brown carpet. Even if you try to imagine it in context it’s still an imagined context. When you build a piece that you have imagined, most of the time it will fall short of your expectations. Even if you have drawings or pictures the same thing can happen because the full size reality in context will not match what you saw in the drawing or the photo. Again you are seeing it in a new context. A piece you have already built will look different if you move it into different room, It will look different under florescent light and again different under incandescent light. Here’s an example of context. Sit back from your screen a few feet and stare at the picture below. Do the two orange dots look the same or does one look darker than the other. So how does one deal with this? There is only one way, you must let go of your preconceived vision of your work and be willing to make changes and adjustments along the way. When you work directly it’s more like having a conversation with the work, the work tells you what to do next or what must be changed. If you continue the conversation the piece will tell you when it is done it will eventually look finished. Some people build full sized cardboard mockups to work out a design, others make full sized versions in cheap stock over and over until they get it right for the same reason. Not long ago I was able to spend several unsupervised hours in Frank Loyd Wright’s Taliesin. The house is furnished with a number of pieces of furniture that are made from lumber yard pine and AC plywood nailed together. These pieces are obviously mockups for pieces that were made later in fine woods, they are three dimensional thinking. In this link, the bench in the foreground is one of these pieces, the only one I could find on line. There are several small tables in the living room made this way. I find it interesting that he put the mockups in his own home. If you are reading this and thinking he’s nuts consider this, Krenov, Maloof and Nakashima all worked directly in some way, and have you ever seen a measured drawing that predates the industrial revolution. 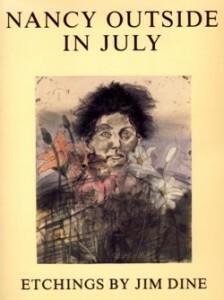 The artist Jim Dine did enough versions of a piece called “Nancy Outside in July” to fill an entire book. This entry was posted in design and tagged philosophy, plywood, series, woodworking. Bookmark the permalink.